Referral Codes are a way to reach out to your favorite clients - or a select group of new customers, or ANY targeted bunch of people - to give them something special. Referral Codes normally wouldn't be featured on your website but rather emailed to the appropriate list, or printed on flyers, or Tweeted as a way to bring in those fans who follow you! When you create a Referral Code, we'll generate a code and a web link that you then provide to your customers. Its as simple as that. 1. Go into your Marketing tab and choose Events from the left sidebar. 2. Create a new Event, and select the brand-new type "referral code" from the drop-down list. 3. Type in a name, description, and the code you'd like to use. A weblink that you can distribute is created in the textbox below, ready to copy & paste. 5. Now, just select the type of special you'd like to extend to your clients - Featured Services, BOGO, or Percentage Off - and just set those up like you normally would. 6. Distribute the code in any number of ways - cards at your front desk, email marketing (through your SpaBoom account or your 3rd party solution - all you need is the link! ), flyers you drop into purchase bags, your Twitter account - any way you'd like! Be creative and have fun with the codes. You could even link to it on your website, giving the perk to anyone who visits your site often. 1. Tax, if you add tax to your GC purchases, will be calculated on the discounted price. 2. Gratuity, if you feature that option, will be calculated on the NON-discounted price. 3. Mail delivery option fees are assessed as normally configured. 4. The IGC after purchase - just like with any other special - shows only the full value or name of the service to the recipient. If the promotion is a Buy One, Get One, your purchaser will receive their bonus GC just like normal. 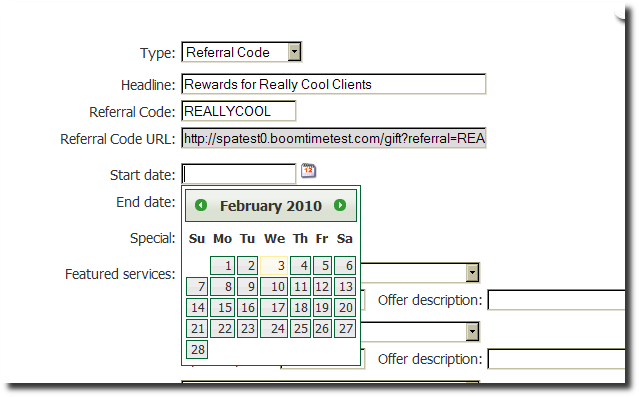 OVERLAPPING OFFERS WILL NOT BE GENERATED: this means if you have a referral code running AND a separate BOGO at the same time, your client will only receive one of them. So there is no danger of your clients "stacking" rewards. That's it! Please consult the other linked Help Topics if you need a refresher on promotions and email marketing features.